Remember that arcade game "Asteroids"? The team behind Japanese space agency JAXA’s Hayabusa2 asteroid sample return mission are hard at work preparing for a groundbreaking feat: firing a bullet at an asteroid. 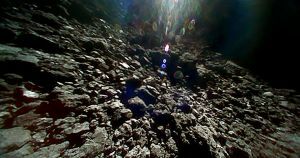 The Hayabusa2 spacecraft launched in December 2014 and rendezvoused with the tiny asteroid named Ryugu this past June. Three separate robot landers gave us stunning glimpses of Ryugu’s surface throughout the year. The next step is for the spacecraft to drop a “small carry-on impactor” — effectively a gun barrel that shoots metal bullets — to loosen up portions of Ryugu, according to the mission’s official website. Touchdown #haya2_TD is planned for Feb 22 ~8am JST! We will have a live web broadcast from the control room (link coming soon) with English translation. Initial data about the surface of Ryugu caught JAXA scientists by surprise. They expected powdery regolith, but observed larger pieces of gravel when the mission’s two rovers, MASCOT and MINERVA-II1, landed on the asteroid’s surface last year. Their solution: shoot the surface to pry loose a sample that could safely be carried back home on board Hayabusa2. In a test carried out in December, the Hayabusa2 team fired an identical bullet at a simulated asteroid surface inside a vacuum chamber back on Earth. The test was a success: plenty of powdery gravel sample for Hayabusa2 to bring home. The team is still planning to deploy Haybusa2’s last rover (MINERVA-II) onto the surface of the asteroid in July before bringing home its bounty towards the end of the year for analysis. Hayabusa2’s next touchdown is slated for this coming Friday.